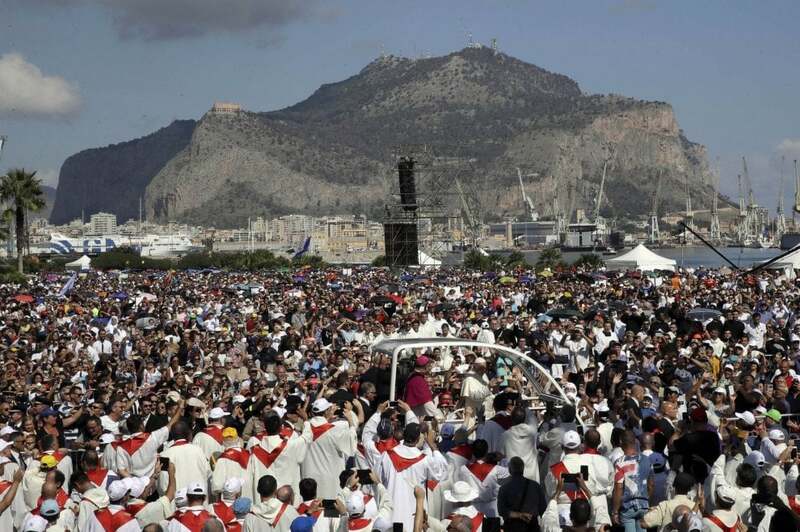 Francis in Sicily on the occasion of the 25th anniversary of the death of Blessed Pino Puglisi, the priest killed by the mafia. "Do not think of yourself, do not run away from your responsibility, choose love! Feel the life of your people in need, listen to your people. Be afraid of deafness, not hearing the people. This is the only possible populism, the only 'Christian populism': to hear and serve the people, without shouting, accusing and provoking disputes ". Palermo (AsiaNews) - "Mafiosi, convert". This was the warning launched by John Paul II in 1993 and echoed today on the lips of another pope, Francis, during the Mass celebrated as part of his visit to Palermo on the 25th anniversary of the death of Blessed Pino Puglisi, the priest killed by the Mafia. 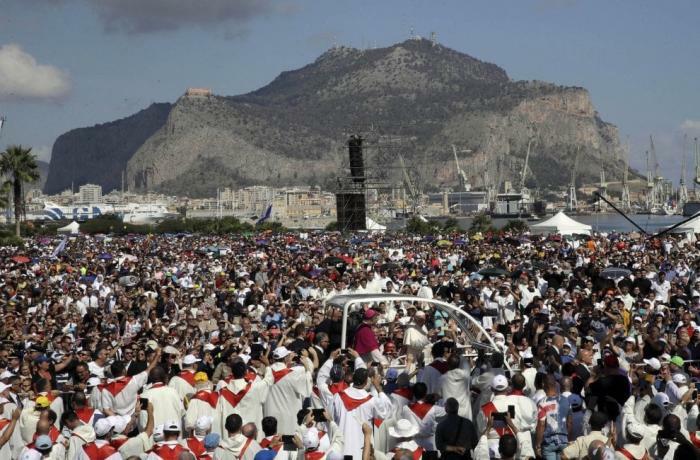 To the over 80,000 people gathered in the Foro Italico of Palermo (in the photo), facing the sea, Pope Francis went on to say: "You cannot believe in God and be a member of the mafia. Those belonging to the mafia are not living as Christians, because with their life they blaspheme the name of God who is love. If the Mafioso litany is, ‘you don’t know who I am,’ the Christian one is ‘I need you.’ If the Mafia threat is ‘you will pay me,’ the Christian prayer is ‘Lord, help me to love. Thus I say to the Mafiosi: change, brothers and sisters. Quit thinking about yourselves and your money. Otherwise, your life will be lost and it will be the worst of defeats ". Beatified in 2013, Don Pino Puglisi was killed by the mafia because he disentangled young people from them. He was parish priest in San Gaetano, in the Brancaccio district of Palermo, controlled by the Graviano brothers, linked to the family of the boss Leoluca Bagarella. "Don" Puglisi’s works aimed to demystify the mafia, people who in the eyes of the children were important, respected. He taught them that one can be respected without leading a criminal life and thus by indicating a Christian life, far from the mafia model, he took manpower from labor bosses, children from acting as drug mules from pushers and adults from more important crimes. Hence the hostility and threats of the mafia who killed him on September 15, 1993, the day of his 57th birthday, in the year in which he had created in Brancaccio the center of Our Father for human promotion and evangelization. Pope Francis focused his homily precisely on the binomials victory-defeat and love-egoism, starting from the sentence of Jesus "He who loves his life loses it" (Jn 12.25). "This - he said - is the defeat: he loses who loves his life. Why? Certainly not because you have to hate life: life must be loved and defended, it is God's first gift! What leads to defeat is to love one's own life, to love one's own self. Those who live for themselves lose. They are egoist, we say. It would seem the opposite. Those who live for themselves, those who multiply their turnover, those who succeed, those who fully satisfy their needs appear to be winning in the eyes of the world. Advertising is pounding us with this idea, of seeking one's own good, of selfishness, yet Jesus does not agree and over turns this message. He believes that those who live for themselves not only lose something, they lose their whole life; while those who give themselves find the meaning of life and win. So there is something to choose from: love or selfishness. The egoist thinks of caring for his life and is attached to things, money, power, pleasure. Then the devil has doors open. The devil enters through his pockets, if you are attached to money. He makes believe that everything is fine but in reality your heart is anesthetized. This way always ends badly: in the end you remain alone, with emptiness inside. The end of the selfish is sad one, alone, surrounded only by those who want to inherit". "Today - he said - we are called to choose which side to stay: to live for oneself, with a closed hand or to give life, with an open hand. Only by giving life is evil defeated ". "Twenty-five years ago like today, when he died on his birthday, he crowned his victory with a smile, with that smile that did allow his murderer to sleep at night, who said:" there was a kind of light in that smile”. Father Pino was helpless, but his smile conveyed the strength of God: not a blinding glare, but a gentle light that digs in and clears the heart. It is the light of love, of gift, of service. We need many smiley priests, smiley Christians, not because they take things lightly, but because they are rich only in the joy of God, in the joy of God, because they believe in love and live to serve. It is giving life that joy is found, because there is more joy in giving than in receiving (cf. Acts 20:35). So I would like to ask you: do you want to live like that too? Do you want to give your life, without waiting for others to take the first step? Do you want to do good without waiting for the pay back, without waiting for the world to become better? Do you want to risk on this road, risk for the Lord? " "Don Pino knew that he was in danger, but he knew above all that the real danger in life is not to risk, it is to exist in comfort, half-truths and shortcuts. God frees us from living on the downside, contenting ourselves with half-truths. God free us from a small life, which revolves around the 'petioles'. Free us from thinking that everything is fine if it's OK with me. The other will fend for himself. He free us from believing we are right if we do nothing to counter injustice. Those who do nothing to counteract injustice are not just men or women. Free us from believing we are good only because we do not do anything wrong ". "Lord, grant us the desire to do good; to seek the truth detesting falsehood; to choose sacrifice, not laziness; love, not hate; forgiveness, not revenge ". "Today the Gospel ends with the invitation of Jesus:" If one wants to serve me, follow me "(v.26). Follow me, that is, start walking. You cannot follow Jesus with ideas, we must get busy. "If everyone does something, a lot can be done," Don Pino repeated. How many of us put these words into practice? Today, before him, let us ask ourselves: 'What can I do? What can I do for others, for the Church? For the society? '. Do not wait for the Church to do something for you, you begin. Do not wait for society, you start! Do not think of yourself, do not run away from your responsibility, choose love! Feel the life of your people in need, listen to your people. Be afraid of deafness, of not hearing the people. This is the only possible populism, the only 'Christian populism': to hear and serve the people, without shouting, accusing and provoking disputes ".